Pokemon Go is adding a new feature that will make sharing photos of your adorable captives even easier. Called Snapshot Go, it's an addition to the AR+ feature that allows you to take pictures of any of Pokemon in your collection in any real-world location. "You can find the feature when looking at a specific Pokemon or accessing the camera in your Bag of items. It’s simple to use. Select a Pokemon and tap on the screen to throw its PokeBall to that spot. Once your Pokemon is situated in the ideal spot, you can then move around it to find the best angle for your photo. Is your Pokemon distracted or looking the wrong way? Brush across it to get its attention, and it will be sure to face you." "We’ve been inspired by the incredible photos trainers have taken in AR+ mode and exploring new ways to further bridge the digital and physical worlds through Niantic’s enhanced AR technologies,” said Niantic's Ryuta Hiroi. 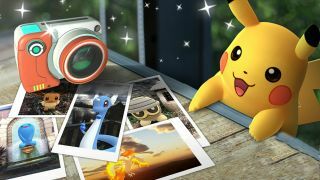 "With the addition of Go Snapshot in Pokemon Go, millions of Trainers worldwide will soon be able to experience a whole new level of augmented reality power, connecting with their favorite Pokemon in the real world like never before."